The spider web of Telephone lines required a complicated system of administration. Signs, color coding and maps allowed signalers to recognize which line went where and which unit was responsible for the maintenance of which cable. The wet earth tended to corrode the isolation on the wires and the blast caused by artillery shells would cause the wires to tear. To protect the cables behind the lines they were usually strung on wooden posts, ideally 3m above the ground. In the front line they would run at knee height, except in places where they had to cross the trenches. Here the imagination of the signalers came into play and they used pipes, tar paper and bits of wood to build protective tunnels to protect the cables from hobnailed boots and moisture. 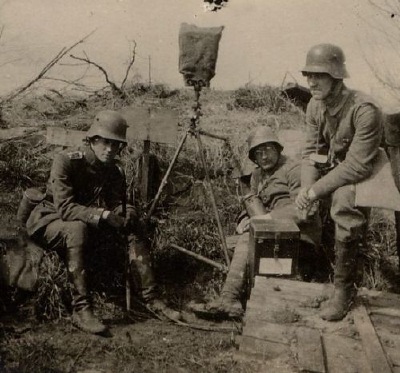 Left: Artillery observers and telephone operators in a quiet moment at the front. From around the summer of 1916 new cables of lead and steel arrived at the front. These could be buried and as such were better protected against blast and shrapnel. As long as there was no or little artillery fire the system worked perfectly. This changed drastically in the case of sustained or heavy bombardment. A damaged line could mean single or multiple repairs, or even the laying of a new emergency line. What the signalers had to go through in such a case required a large degree of bravery and self sacrifice. When the communication failed they would have to leave their bunker, often the trench as well, to go out into the night, rain, snow or barrage. 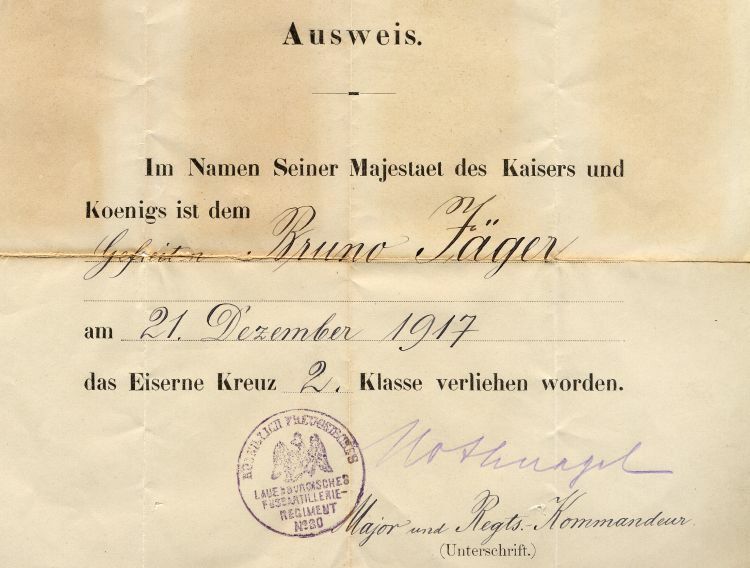 "Jäger has served on the Regimental staff since May 1917. In this time he has proved himself to be a very reliable telephone operator and in the last days of the Flanders offensive distinguished himself with courageous, brave and unshakable actions. At all times he undertook cable patrols, repairing lines under heavy enemy fire, thereby insuring the command posts had communication with the guns and that commands and orders could transmitted. Jäger is fully deserving of the proposed award." "Between the bomb carters the Observer and his telephone operators crouch in a hole they had dug. They remain in position, sleepless, with the telephone to their ears. Occasionally the connection to the battery would succeed, only to have the telephone cables ripped by explosions. At these moments the operators crept uncomplaining out of the hole and went into the withering barrage to repair the line. 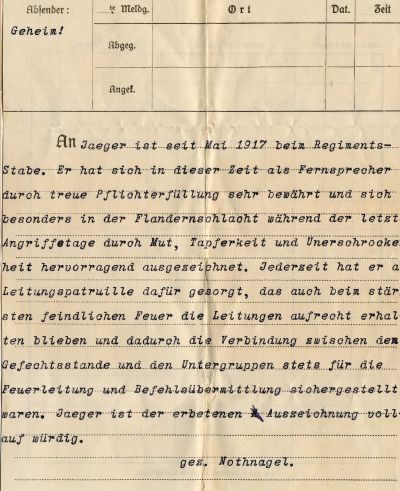 Many, many did not return.... and the next man would go out to do the job...."
Below: Jäger's Iron Cross 2nd Class award document.